Civil War historian Carolyn Ivanhoff will deliver a lecture on Connecticut’s role in the civil war on Saturday, March 16, 2:00pm – 3:30pm at the Community Room of the Easton Public Library, 691 Morehouse Road, Easton, Connecticut. The lecture is sponsored by The Historical Society of Easton. There is no charge and reservations are not required. Four close friends from Connecticut marched down to Gettysburg, but only three returned. To hear the story of these men, the Historical Society of Easton is sponsoring a lecture by Carolyn Ivanoff, a Civil War historian who is an assistant principal at Shelton Intermediate School. 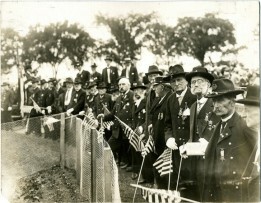 The four men enlisted in the 17th Connecticut Volunteer Infantry, Company D and “they marched, tented, survived the elements and disease and fought every day on the hard road to Gettysburg” where “one of them would be killed, two wounded and only one left standing,” according to a press release sent by Emlyn Duemmler. Ivanoff will follow their stories with letters, primary documents, period-sourced documents and more. For more information, visit the Historical Society of Easton on the web. The lecture is free, but donations are always appreciated. For more information call 203 581 0850.